When the average buyer today is somewhere between two-thirds and 90% of the way through the buyer’s journey before they make their first contact with Sales, it’s imperative to align your Marketing and Sales teams to create sales enablement. Sales enablement is the process of placing the most effective content marketing assets into the hands of the right sellers at the right time in order to further sales opportunities throughout the buyer’s journey. The need for more effective sales support is growing—here’s how businesses today work towards a better sales enablement process through Sales and Marketing alignment. The role that Marketing plays in sales enablement is crucial. Today, the line between Sales and Marketing teams is blurred. There are no longer strict divisions between these two teams. Instead, both work toward a common goal and build a single revenue-generating team by developing processes along the way that enable them to accomplish this goal together. This is sales enablement. And despite what it sounds like, sales enablement is not just about Sales—Marketing’s role in sales enablement is crucial. In companies where sales enablement is a top priority, budgets have nearly doubled in the past two years according to SiriusDecisions, and companies have increased investments in sales enablement technologies by 69%. This means that more and more companies are recognizing the huge impact that an alignment between Sales and Marketing will have on their predictable growth efforts. The question that everyone wants to know is, how do you create sales enablement? Here, we offer some tips on what you can do to get Marketing thinking like Sales, and Sales thinking like Marketing, to create a sales enablement culture in your company. A service level agreement is created between Sales and Marketing to ensure that goals are aligned throughout the process. In an SLA, Marketing agrees to generating a certain number of quality leads, and Sales agrees to the sales process used to close these quality leads (or SQLs) into customers. An SLA should be based on real numbers, for both a Sales and a Marketing quota, and it should be tracked, monitored, and readjusted as needed over time. Start a sales enablement program off the right way and make sure everyone is on the same page. Maybe Marketing has been targeting the Marketing department of some companies, when they should have been reaching out to the VP of Sales with their marketing assets. Revisit your target prospects and define where they can be found. This will help both teams as they create and distribute the right content to the right prospects, at the right time. For example, if your target prospect is active on LinkedIn, make sure both teams distribute relevant, quality information there. This step is key in sales enablement. Content is just content if it’s not leveraged in the right way. This means getting into the hands of the right people at the right time. We’re going to assume here that your content is amazing, remarkable, valuable, educational, and exciting—because it has to be if you want your prospects to engage with it. Here we are talking about what you do with that amazing content. 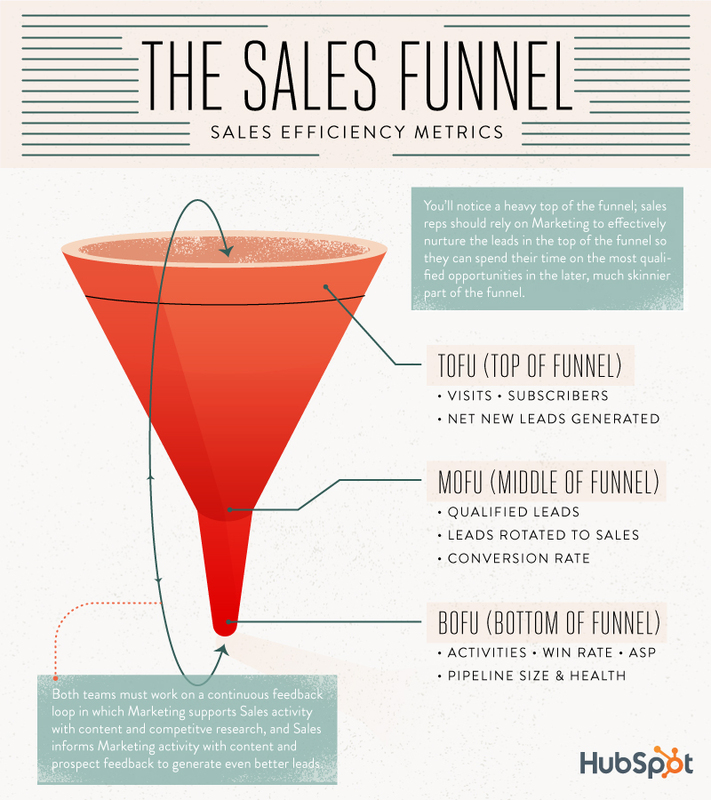 This is where Marketing spends the most time nurturing leads into Marketing Qualified Leads (MQLs) and then into Sales Qualified Leads (SQLs). The content in the Awareness Stage of the Buyer’s Cycle consists of Top of the Funnel offers like blogs, eBooks, how-to posts, infographics, etc. These content assets are meant to educate and engage prospects and convert them into leads. It is the first stage in qualifying prospects, so it’s important that the content here is valuable, relevant, and will move the right prospect to the next stage of the buyer’s journey. The Consideration Stage is where Marketing’s hard work has paid off, and MQLs are ready to be converted to SQLs and handed off to Sales. This is a crucial stage for Marketing, because they have to be able to identify which leads are quality leads and ready for a sales discussion. Content in this stage consists of Middle of the Funnel offers such as assessments, white papers, eGuides, etc. These assets help prospects further acknowledge their problems, and analyze solutions that will help solve them. The Decision Stage is where all the hard work that Marketing has put in comes down to Sales. It is now the Sales team’s job to leverage content assets to close these opportunities into customers. In this stage, Marketing materials are created that are Bottom of the Funnel offers, like case studies and comparison guides. These offers are the collateral that Sales needs to win more deals. All of these steps in the sales enablement process must constantly be analyzed and improved upon. The Sales and Marketing relationship, whether it’s new to your organization or not, must be open to constant evolution. Processes change, technologies advance, and the way that these teams work together has to be open to adaptation. Through Sales and Marketing automation technology, this can easily be accomplished. The analytics gained about prospect behavior, average deal size, # of leads generated, % of MQLs to SQLs, % of deals closed from MQLs, and so on, will help guide the Smarketing relationship. Sales enablement is created through effective alignment of Sales and Marketing—Smarketing as we like to call it. The close relationship between the two is imperative for the predictable growth of your company. Create a common goal, leverage content marketing assets effectively and appropriately, and monitor and analyze the progress of these efforts to achieve sales enablement and Smarketing. Learn more about how to create sales enablement through Smarketing. Download the Smarketing eBook below and align Sales and Marketing today.